Before the Star Wars Kenner toy craze of 1977 - 1983, Mego ruled the science fiction toy world (with some competition from Mattel and Kenner) with great action figures and playsets from such movie and TV franchises as Star Trek and Planet of the Apes. On the latter front, Mego manufactured and marketed a whole slew of great Apes-centric playsets. These included my favorite, the Forbidden Zone Trap, and a Planet of the Apes tree house. 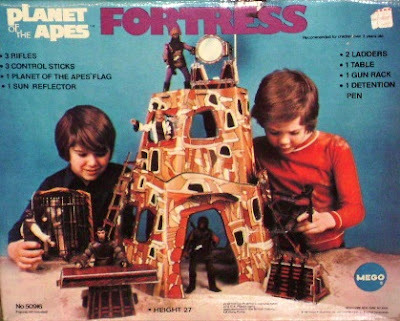 The only Mego playset I didn't own came out at the same time as the Apes TV series (1974 - 1975): The Planet of the Apes Fortress. 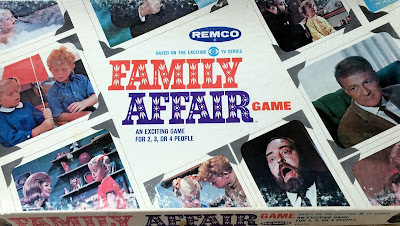 This crudely pyramid-like structure stands a whopping twenty-seven inches tall, and consists of two fully-detailed play levels, upper and lower. The neatest item, however, is the Fortress's (working) sun reflector, which actually appeared as a simian signalling device in one episode of the short-lived series. 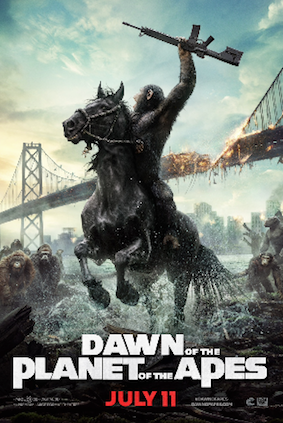 Galen (Roddy McDowall) used the device to send a false message to a gorilla patrol, if memory serves. Today, the Planet of the Apes Fortress playset and all its gear often sell on E-Bay for over three hundred dollars, a factor which likely means I won't get my hands on one until I'm independently wealthy. But one can dream, right? Below is a vintage commercial of the Planet of the Apes Fortress.